Mobile app measurement and advertising platform Flurry is expanding its product lineup with a new service that will allow app marketers the ability to track the effectiveness of their mobile ad campaigns. Flurry Ad Analytics, as the service is being called, works with the major ad networks, such as Apple’s iAd, Google Admob, and Flurry’s own AppCircle, for example, and will show from where users arrived, which campaigns were effective, and what any given network’s userbase looks like over time. This is a big deal for mobile app developers and marketers because, currently, these folks are buying from something like ten to fifteen ad networks, and yet have little visibility into the types of users being returned. The timing is right for a service like this, explains Flurry VP of Marketing Peter Farago, because app publishers are starting to move beyond the typical “spray and pray” strategy where they would do anything to just get to the top of the charts. No single ad network can get your app to the top of the charts, and if they can, then they’re returning low-quality users, he says. So what’s happening instead, says Farago, is a shift to a more common sense type of marketing. As in: wouldn’t it be nice to get people who might actually like and use the app to download it? “We’ve noted that there’s a stage of maturation we’ve entered into,” Farago says of this shift, “you have companies that are approaching building their audience using more of a classic marketing framework.” They’re looking for quality users, not just numbers. With Flurry Ad Analytics, the service can sort users from the various ad networks and campaigns into buckets, allowing app marketers to see which strategies were the most effective – “effective,” of course, being determined by the app maker itself. Maybe they were hoping to target 18-24 year old males, or maybe they wanted to pull in users who would spend on in-app purchases. The metric for what’s “successful” doesn’t matter – it’s just about bringing a sense of transparency to the system. And because these users can now be segmented off, app marketers can watch their activity over time, too. Do they remain engaged? Do they refer friends? Do they upgrade to premium features? Etc., etc. The goal is to support all the various ad networks, but the all the majors work right out of the box. There are ways you could configure this feature to track other campaigns, too, if you really wanted to. (As long as there’s a campaign URL to track, you could track an email or online campaign, for example). 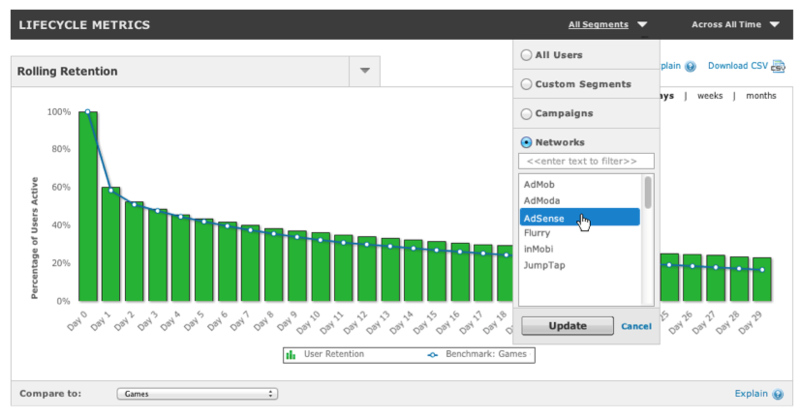 Flurry Ad Analytics is built on top of Flurry’s Analytics service but will be offered as a premium, standalone service. The cost starts at 5 cents per install and goes down on a per install basis as volume increases. The service goes live next month, but Flurry is accepting sign-ups as of today from its website.